When consumer Google+ shuts down on April 2, your Google+ "Photos from Posts" and "Photos of You" albums in your Album Archive will be deleted. Google Photos is a separate product, and will NOT be shutdown. Any of your photos that are in Google Photos will NOT be deleted. Then in 2015 Google announced that Google Photos would be a standalone product, split away from Google+. That was a harbinger of doom: just two months later Google announced that Google+ would no longer be a social layer across Google+. The new Google+ no longer included any special photo features, and had a new design where Profiles no longer even had a Photos tab. But despite that, it's not surprising that many people remember the days when photos were central to Google+ and are concerned that their photos will be deleted when consumer Google+ shuts down on April 2nd. The Google+ "Photos from Posts" album in Album Archive. Some of these images may also be in Google Photos. The Google+ "Photos of You" album in Album Archive. There will not be a copy of these images in Google Photos, unless you uploaded the photo yourself. Note: if your website or blogs links to a Google+ photos, there is a strong chance those links will stop working. For example, the Friends+Me Google+ Exporter lets you create an archive of your Google+ posts that can be imported into Blogger or WordPress. If you do not also export your original images and upload them to WordPress or Blogger along with your posts, the post images will likely disappear after April 2nd. Images uploaded directly to Blogger or other platforms won't be affected. If you want more detailed instructions on how to view or download your Google+ photos and videos from posts, read on! Optional: if you want to see images shared by a Google+ Page, click your profile photo at top right, then select your Page's Brand Account from the list. If you don't see it click "All my Brand Accounts", and then the Brand Account name. Your photos are arranged in dated albums. The date is the day, month and year you shared the image on Google+, not the date the photo was taken or edited. This may work for you if you haven't uploaded many photos, or only want to save a few. Otherwise it's not practical to save a copy of your images that way. Google Takeout is the best way to download all your photos at once. As noted above, all photos that you uploaded to Google+ Photos and all albums you created before Google Photos split away in 2015 should be in Google Photos. You can double check your Google Photos to make sure a specific photo is there. Sign in to Google Photos (photos.google.com) or open the Google Photos app on your mobile device. Note that the date you shared your photo on Google+ may be different than the date of the photo itself, which is how Google Photos is organized. In my example above, I shared the image to Google+ in October 2014, but I took the photo in January 2014. Even though the image was "enhanced" by Google+ in October, it retained its original creation date in January in Google Photos. It probably isn't practical to do such checks for more than a handful of images. You can create an archive of the photos and videos you shared on Google+ and the photos you were tagged in using Google Takeout. Note that this will not include photos you added to comments. It also doesn't include photos or videos uploaded to other Google products like YouTube, Blogger or Hangouts. If you have been regularly sharing images to Google+ this archive is may be quite large. If you don't have storage space on your hard drive, or only have a mobile device, you can have your archive delivered to a cloud storage account (Google Drive, OneBox, Dropbox, Box). Optional: if you want to archive images shared by a Google+ Page, click your profile photo at top right, then select your Page's Brand Account from the list. If you don't see it click "All my Brand Accounts", and then the Brand Account name. Get detailed instructions for downloading a Google+ Page's content. From the list of Google products, make sure you have Google+ Stream selected. You may want to de-select other Google products first, or click this link for Google+ data to be pre-selected. Click All Google+ Stream data included to choose to only download your photos and not posts or other content. Click OK after selecting your data. At the bottom of the page, click the Next button to set your Archive options. If you only have a mobile device or otherwise not much storage select the option to have the archive sent to a cloud storage service. If your archive is very large you may have to pay for additional storage. Google Drive (check your available storage space). Google accounts come with 15GB free, including storage used for Google Photos and Gmail. This option is not available for Brand Accounts. Dropbox (check your available storage space). A free account comes with 2GB space and the option to earn more. Microsoft OneDrive (check your available storage space). A free account comes with 5GB space. 11. Google will send you an email when your archive is ready. 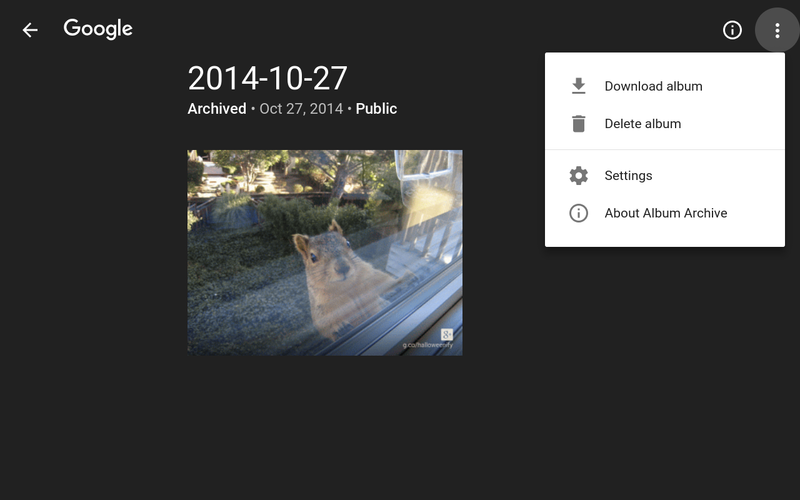 What's in your Google Takeout Google+ Stream Photos archive? Unzip the takeout archive file. On most systems you can just double click the file. If your archive is in multiple files, unzip all of them. Open the Takeout folder. You should see an index.html file and a folder for each product you downloaded. Open the index.html file in your favorite web browser. This will show you an index of the archived files, and any error messages. 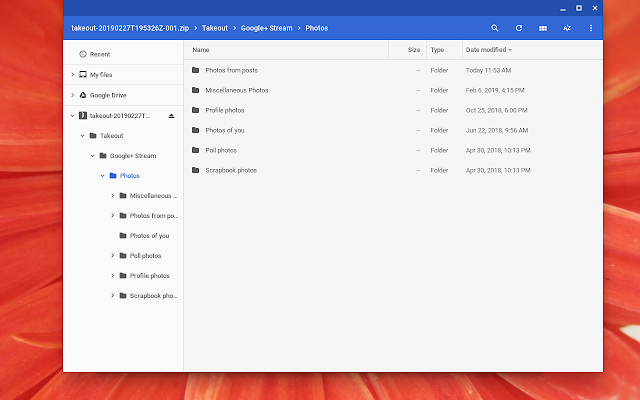 To access your photo files, open the Google+ Stream folder, and inside that, the Photos folder. Photos from posts: photos you uploaded to Google+ in albums labeled by date. Images should be in their original format. Photos of you: files with links to the photos that you were tagged in. The original images may not be available after April 2, 2019, so you may want to open and download them. The files aren't organized in a very user friendly way, unfortunately, but at least it's a backup. What can you do with photos downloaded through Google Takeout? Images and videos downloaded through Google Takeout should be in their original file format. That means you can use them like any other image file. If you just want your photos to be accessible online and shareable, but don't care if they are public, I think Google Photos is your best bet. That's especially true if you are already using Google Photos to back up your new photos, or have older photos originally uploaded to Google+ in your Google Photos account. Upload all your images to Google Photos. Use the desktop Google Photos Backup & Sync app manage that process. You can upload unlimited "High Quality" photos and videos to Google Photos for free. You can also upload your images to Google Drive using the desktop Backup & Sync app. Images and videos uploaded to Google Drive directly count against your Google account's storage limits. Amazon offers "unlimited full-resolution photo storage" with Prime. Note this only includes 5GB video storage. Add your photos and videos to your desktop image management software like Apple Photos (integrated with iCloud Photos) or Windows Photos (integrated with OneDrive). If you just want to keep all your images offline, Adobe Bridge is free photo organization software for your desktop computer. Upload your photos to photo site like Flickr (up to 1000 images for free accounts, unlimited for Pro accounts) or 500px (limited to 7 uploads in a 7 day period). Upload your videos to YouTube (unlimited), Vimeo (storage limits) or other video site. Share some of the photos and videos to your favorite social network (other than Google+) like Facebook, Instagram (upload from mobile devices only), or Pinterest. If you want to sell your photography, build a site using Wix, SmugMug, Zenfolio or other sitebuilder platform aimed at photographers. June 2011: Google+ launches as an invite-only service, includes "Instant Upload" to back up photos on your phone to a private album in the cloud. September 2011: Google+ launches for everyone. October 2011: Google+ Creative Kit introduced, "a friendly way to make powerful edits to your photos". December 2011: Updated lightbox experience on desktop and "new photo tagging experience"
April 2012: Redesigned Google+, with bigger "full bleed photos that's make you really proud to post. September 2012: Google acquires Nik Software, makers of the iOS Snapseed app. The New York Times headline: "Google Buys Nik to Lure Photographers to Google Plus"
August 2013: Google+ Photos app for Chromebooks launches (announcement on Google+) and you can see your Google Drive photos in Google+ Photos (and vice versa). Users were also given more control over which photos were shown in "Highlights" view on their profile (announcement on Google+). October 2013: Full size backups and autosync, search your photos by object, control how much "Auto Enhance" is used. Plus three new Auto Awesome effects: Action, Eraser and Movie highlight reels on some devices. You can still download the "Moments that matter" booklet showcasing the photos highlighted at the announcement. December 2013: Shake your Android device to make it snow in your photos, and users got an AutoAwesome movie recapping their year's highlights in photos. February 2014: HDR Scape effect available on the web (already in Snapseed for iOS and Android), Zoom in on images in lightbox view. June 2014: : Edit your previous edits to your photos, introducing Auto Awesome Effects (announcement on Google+). Paint your face with a flag with #WorldCup hashtag. Google+ app now works with Chromecast to view photos. May 2015: Google+ introduces Collections: "Every collection is a focused set of posts on a particular topic, providing an easy way for people using Google+ to organize their interests and focus areas." also May 2015: Google Photos launches as a separate product from Google+. Photos previously uploaded to Google+ and albums created in Google+ can be found in Google Photos, as can albums and photos from Picasa Web Albums. It does not include photos from Blogger, Hangouts or - going forward - uploaded directly to Google+. August 2015: Google+ Photos starts to shut down (announcement on Google+), Google Maps Views went offline, replaced by Google Maps contributions (announcement on Google+). March 2016: Google no longer supports the Picasa desktop application. May 2016: Deprecation of Picasa Web Albums begins. August 2016: You can now add photos and links to Google+ Comments. Album Archive is live, the one place to find all your images uploaded with Google products, including Google+, Blogger and Hangouts. January 2017: Zoom images in Google+ lightbox on the web. Classic Google+ shuts down. Your Album Archive contains photos from Google Photos already, plus images uploaded through Google+, Hangouts, Blogger and other Google sites. There isn't any way to move images that are not already in Google Photos (like Google+ Photos from Posts or Blogger images) into Google Photos. 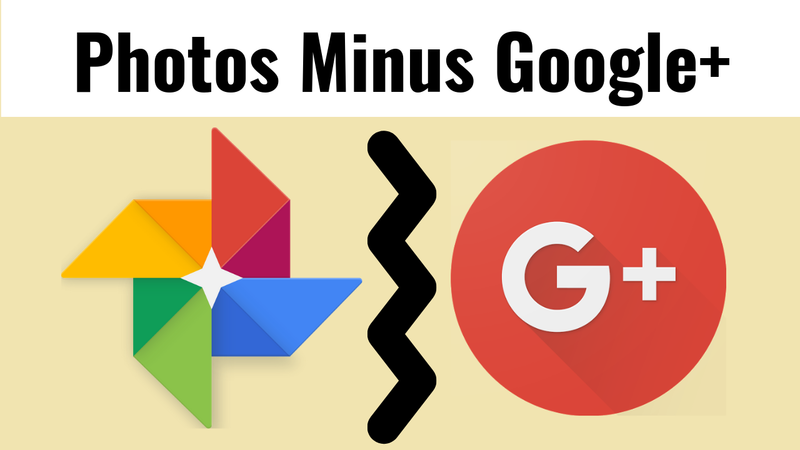 You will need to use Google Takeout to download those photos, then re-upload them to Google Photos.